Queen of Wands shares self discovery, sensitivity and spirit – awakening to the deepest essence of who you are as your love of home and the appreciation of nature is translated into feeling and understanding. Your attractive personality draws people to you because you just naturally love life and people. You see no purpose or value in deceit, control or dominance. Your attitude is sensible and you are most helpful when providing good advice. People do not fear asking you for assistance because they KNOW they will be helped if it is at all possible. Allow your physical senses to alert and reveal, follow your natural perception. See through the disguised and unseen. See danger and “feel” opportunity. Sound practical judgment is needed in your business affairs now – financial gains are possible from people in authority. It is very important that you understand the feelings and emotions of others now – exercise your generosity and patience as negative, stubborn, domineering qualities begin to surface. For a person who loves life with a fiery joy – the world appears to respond by protecting them from harm and sending them joyous experiences. It is time that you recognize your personal power and begin to display your self – confidence, generosity, burning passions and desires. Behave spontaneously and free your quick temper by utilizing your creative energies and inspiring those energies in others. Radiate from within – reveal and transform, heal and transmute – let your spirit soar. See, hear, feel, sense and taste the truth. Strive for sharp perception as you defend your position and integrity. Intuitive, spiritual, vibrant, fiery, introspective, humorous, mother of beliefs, benevolent, dedicated, philosophical guide, spiritual advisor, spiritual nurse, mystic, metaphysician, natural leader by example – ruled by the drive of the heart. Channel for divine insight, inner confidence, spiritual energy/drive. In the first position: Yours is to bear witness to everything you experience, sharing your entire life at all of its levels and in so doing motivate others to do likewise. This is to show the correctness of things in your actions so that others may follow. In the second position: This may be someone, perhaps a family member on whom you can fall back. The accuracy of your information and its relevance to the future are decided advanteges to doing the right thing at the right time. In the third position: Think well on this card for she is coming to you in one guise or another. As a guide and source of inspiration, she is directing your attention directly to your spiritual house, that you may increase the efficiency there. In the fourth position: Your earliest tapes of imprint are of this spiritual figure of authority, perhaps you own mother. But it could be of an older family figure such as a grandmother or of course someone outside the family, perhaps someone famous whom you came to admire. 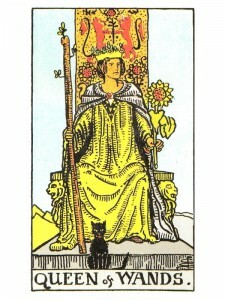 In the fifth position: The Queen of Wands occupies your thoughts, either in her person or her characteristics. The soothing effect of this passive centering is the enviable state of many meditations. From here much can be accomplished. In the sixth position: This queen is in your emotional horizon in the near future. If she is not presenting herself in person, then spiritual matters are pulling at your heart. The message content of your creative work may be raised. Your relationships may take on a deeper significance. In the eighth position: The queen is in your house. Her energy should bathe everything in a warm glow. The healing here transcends the physical, as it is a centering of all four levels that is taking place. In the ninth position: The Queen of Wands fills your heart. She may be the centerpiece of your affection or the centerpiece of a creative project underway. Her programs may dominate your feelings. In the tenth position: Here is the support, the energy and resources that you need to enhance your Spiritual Plane and it may well come in the physical personage of the Queen of Wands. It may however, be the access to what she represents. You are very welcome. Have a blessed day! Oh wow…. Thank yo so much…. You are amazing as always!!!!! Wish you the absolute BEST!!! Hey Diana…… What if all four Queen court cards show up in a 10 card Celtic cross spread reading? QP #1, Ace of Cups #2, QW #4, QC #5, and QS # 7, The World #9 and Knight of Pentacles number 10. I asked no specific question, just left it up to the universe to tell me what I needed to know. Hate to ask but I never landed in this predicament before.